The words ‘woods’ and ‘forest’ originally meant the same thing. Since they both came into use, they have gained different meanings. While they’re still similar and the differences between them are rather vague, there are some cases where one will definitely be incorrect. English is a combination of two language branches: Germanic and Italic. It originally started out as a Germanic language. However, in the eleventh century, a group of people called Normans invaded. They came from what is now known as France, specifically Normandy, and they brought their language with them. When they conquered England, their language mingled with Old English and their vocabulary stayed. In most cases where the French words meant the same thing as the existing English words, they gained different meanings. For example, the words ‘beef’ and ‘cow’ originally meant the same thing, but the French word ‘beef’ changed to mean the meat of a cow instead of the animal itself. ‘Wood’ came directly from the Germanic branch. It is from the Middle English word ‘wode’, and before that the Old English word ‘widu’. Both of them meant ‘tree’ or a group of trees. Today, the word mainly means the material that makes up the inside of a tree, though it can still mean a group of trees. ‘Wood’ is sometimes used to mean a definite area or to name an area, while the plural is an indefinite. For example, a place might have ‘wood’ in the name, while a group of trees in general would be woods. It’s more common to say ‘the woods’ than ‘the wood’ when talking about a place. The word ‘wood’ can also be used as a verb. ‘To wood’ can mean one of three things: to plant trees in an area, to get supplies of wood for something, or to gain a supply of wood. ‘Forest’ came in from French. Interestingly, while most of French came from Latin, the word ‘forest’ was picked up from Germanic. It was originally the word for a fir or pine tree. From there, it was altered to fit the Latin language and then moved into French. While the word ‘wood’ refers to the material in a tree, the word ‘forest’ only means a collection of trees. In some cases, it can be used to refer to an area set aside for a specific purpose as well. For instance, a national forest might not have a lot of trees, but it is still a place set aside for nature. In England, some areas called forests were restricted, such as a royal hunting ground. It can also be used as a verb. ‘To forest’, or ‘to afforest’, means to turn an area into a forest. When describing an area covered in trees, there is a difference between the two. There are no specific numbers on this, but a forest is generally assumed to be larger than woods. Another major feature is the density: woods will have wide distances between trees, while forests will be dense, making them much darker. In some forests, the canopy of trees will block out the sunlight. 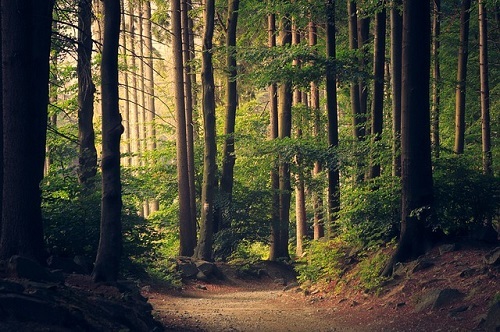 Forests might also be assumed to be more dangerous, given that they tend to be darker than woods. In any event, a small group of trees is definitely woods, while a large group is definitely a forest. A medium group will most likely be judged on how dense it is. To summarize, the word ‘wood’ originally meant ‘tree’, while the word ‘forest’ came from a word that meant ‘fir trees’. ‘Wood’ means the material that makes up a tree. In the plural, it can mean a group of trees. ‘Forest’ means just a group of trees. Between the two, woods are smaller while forests are larger and denser. Kianna. "Differences Between Woods and Forest." DifferenceBetween.net. November 21, 2016 < http://www.differencebetween.net/language/differences-between-woods-and-forest/ >.